An experienced Freemason and award-winning psychologist provides a precise and engaging exploration of the core philosophy and practices of Freemasonry-and how the order's esoteric symbols and ideas can guide today's generation. Popular books and movies often depict Freemasonry as a shadowy, mysterious and possibly sinister organisation, while TV and magazine specials on Masonry frequently leave us with more questions than answers, and without a clear understanding of how to sort myth from fact. Mark E. Koltko-Rivera, a practicing thirty-second-degree (32º) Mason, has created a simple, authoritative, and accessible introduction to the history, rites, and meaning of Freemasonry. It may be the single most reliable short guide to Masonry, written by a widely recognized psychologist and scholar of esoteric history. Whether you're interested in becoming a Freemason yourself, or simply want to learn more about this fascinating subculture, Koltko-Rivera's trustworthy guide explores all the basic issues around Masonry, such as- What is Freemasonry, and what is its history? How does one become a Freemason? Why do men become involved in Freemasonry in the first place? What are some of the most important Masonic symbols? What do Masons get from their involvement in Freemasonry? What changes does it make in their inner and outer lives? What is it like to participate in the initiatory rituals of Freemasonry? How does this differ across the different rites or orders of Masonry? What are some of the great historical controversies and myths surrounding Freemasonry? How is Masonry relevant today? Start reading Freemasonry: An Introduction on your Kindle in under a minute. Mark E. Koltko-Rivera, Ph.D., is a thirty-second degree (32°) Freemason as well as a doctor of psychology. Koltko-Rivera has received several degrees of initiation administered by the York Rite of Freemasonry, culminating in his status as a member of the Masonic version of the Knights Templar. He has written extensively on Freemasonry for publications that serve a Masonic audience, and has also written award-winning scholarly works in the fields of clinical and counseling psychology. Koltko-Rivera received his doctoral degree in counseling psychology from New York University in 2000. He lives in New York City. Looking for the best short introduction to the world of Masonry? Mark Koltko-Rivera's Freemasonry: An Introduction may be the perfect choice. Concise, clear and accurate, this little book artfully provides basic information about what Freemasonry is, what initiation really means, and what symbols are and how Freemasons use them. Along the way, Koltko-Rivera also sheds needed illumination upon the fallacious claims of "anti-Masons" (as critics of the fraternity are known) and the misconceptions of the Craft which are so frequently seen in popular culture (such as Dan Brown's novels). For the current generation of American Masonic readers, this is the first primer on Freemasonry that really embraces the concept of the Masonic experience as an initiatic tradition. That is what most strikingly sets Koltko-Rivera's book apart, and what makes it particularly relevant to today's readers. This book is an excellent basic introduction to Freemasonry--what it is, what it is not, what benefits to one's character can be gained from it. I found it to be very clearly written and an engaging book to read. I would have liked to have seen a bit more detail about the affiliated orders for wives and other family members, but what was included was, I think, appropriate for a book primarily designed for men wanting to learn more about Freemasonry. I would recommend this to anyone thinking of becoming a Mason or just wanting to learn more about the order. 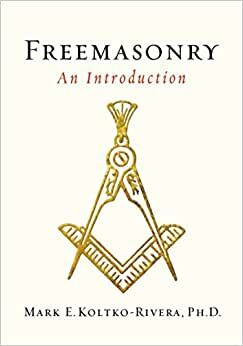 I hope the author will write further books about Freemasonry, because I would love o read them. This small volume is well thought out and written in a clear manner, It is considered by this reviewer as reasonable read for the new Mason who wants to know. Like all Masonic writings, it might have a tendency to lean towards the teaching of the authors own jurisdictional concepts of his Grand Lodge. With that said read it, enjoy it and seek other writings. Weigh the one against the other, compare and then read and question some more. Seek both the visible knowledge and the more deeply hid meanings behind the teachings of the Craft of Freemasonry. It is not just ritual and ceremony, that helps but there is a deeper meaning which should be sought. I will be earning my 1st degree on January 3rd. This book was interesting and an easy-read. It was a key factor in my decision to petition my local lodge, providing insight that was hard to find online (which is rife with conspiracy and misinformation). 3.0 out of 5 starsGood Introduction !!!!!!! Even though I recognize that this is s a good introduction to Freemasony, the author does not accept any of the so common critics to this Fraternity. He gives many explanations to defend the Fraternity, which it is understandable from a Mason. Unfortunately, when something bad is said about Freemansonry, the easiest way to deny that is that the fault was performed by indivudual Masons which usually they were expulsed from the Fraternity (see page 112: "In essence, P2 commited its crimes as a renegade lodge, broken off from legitimate Freemasonry") . There are so many controversies about Freemasonry that it is very hard to know what it is true or not. One of the things that it is very hard to believe is that the Masons do not help each other even in unethical situations. Many people know that they help each other in many circumstances of whatever situation. Also, the explanation of the author about Albert Pike and Satanism is wird. One of the good things of this book is that the author provide enough information of anti-masonry too so the reader can deep further on the controversies too.